Recent times of hypercompetitive management demand newer and more advanced solutions for data operating. Across the whole enterprise, differentiated data is needed, thereupon rapid information transmission is more important than ever before. Losses, arisen due to data forwarding delays, will never be regained and the solution able to reduce them was a necessity. Whole business intelligence and performance management are about improving enterprise profitability in the matter of information flow. All in all, more and more advanced solutions have became needed, and so have been the vendors' offers. As a result, the enterprise data warehousing platforms' popularity has significantly grown up. Unfortunately, there are two sides to every story, and broadened offer, so profitable for some, has become also a curse for others. Thousands of differentiated tools work on diversified file formats, what results in impeded cooperation among them. Millions of dollars are being spent every year on hardware, software, services, maintenances, and so on. Further millions are being spent on implementing solutions enabling the cooperation between different modules. The only way to omit that, as managers had to check themselves, is to choose one, single but best-fitting enterprise data warehousing solution enough to control all the factors, changes, and forecasts. Recent management has to struggle with more and more limited budgets, and the task is to invest in best possible solutions without a necessity to pay more than it's been already stated. All in all, the choice of a proper enterprise data warehousing platform has never before been so difficult. Differentiated parameters, plenty of factors, costs of implementing and ownership... What features do really condition choosing EDW platform? Description of demanded features should be started with defining what exactly enterprise data warehouse is and, then, its functionality. From the very beginning, data warehouse itself is a repository, where information is stored. Well-organized repository is usually a great support for reporting and analysis, two processes extremely important for performance management. Just for reminding, generally the whole performance management might be boiled down to asking and answering three vital questions. Its first stage demands finding out the current company's performance. In a word, how is a company doing, whether it's on or off track? Having it stated, comes a time for the second PM question - why the things go this way and not another? What are the factors conditioning gained profits and beard losses? Finally, there's yet another question - what should be done? What to do to improve the strategy and - as a consequence - increase profits or reduce losses? Those three questions apply to the three general stages of performance management - reporting, analysis, and decision making. Data management is extremely complex process, which enterprise data warehousing is only a part of. The scheme below illustrates general information management structure. 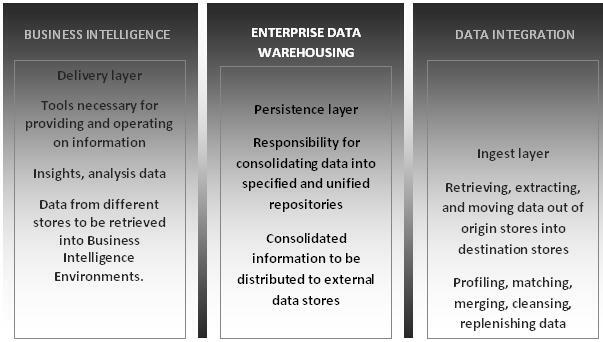 Even the basic statements of typical data warehousing and much more advanced enterprise data warehousing seem similar, due to significantly more complex tasks, there are a few features characterizing data warehousing dedicated straight for enterprise use. All the differences between typical DW and EDW come out from the organization's complexity - the larger company the more advanced data warehousing platform is needed. The first condition is significant for all the types of data warehousing but its importance grows in proportion to organization's magnitude. A Data Warehouse usually described as a single version of truth and becomes crucial in multidepartmental management. Even though it sometimes seems that different departments of one organization are totally separate and have nothing in common, they all base on the same data that's necessary for proper decision making. Thereupon, it's extremely important to have the same information across the whole enterprise. Every department needs same, timely and proper data to maximize the efficiency. It's also connected with data flow that got more important than ever before. The decision made by managers must be known by workers in a few seconds! And - widdershins - the results of particular tasks must be immediately known by managers. Once again: coherence, timeliness, regularity, and accessibility - these are the features that might be boiled down to one, called 'single version of truth'. One of the most important things that condition EDW platform's success, is implementing solution as a Mission-Critical Environment. No one should be reminded of data importance in recent management strategies, but the environment is a key to reconciling higher and higher requirements, incessantly growing data volumes, more and more rigorous timeliness demands, and - as it's a curse for many managers - limited budget. Thereupon, Enterprise Data Warehousing platforms have to be designed in a way enabling normal functioning even while struggling with unforeseen adversities. A platform has to guarantee an incessant unfailing operating in every case. First of all, Mission-Critical Environment has to prevent any unauthorized changes, random errors, and accidental data destruction. But if any of them happens, EDW platform should be able to reduce losses and - therefore - offer efficient security systems. Even recovering only a quarter of data is better than setting everything from the ground. And 'better' - business traditionally - obviously means 'cheaper'. As long as the matter doesn't exist in a case of straight, tiny companies, the ability of supporting multiple subject areas is extremely important for large, complex enterprises. As it's been already mentioned, even the most differentiated departments across one organization usually base on the same data conditioning their work. Thereupon, data compatibility is so important, and implementing every additional solution usually means losses of consistence. That's the thing that need of simultaneous multiple subject areas supporting stems from. Enterprise Data Warehousing platform has to secure well operating with production, HR, finance, marketing, and so on. Plenty of tasks, one solution. Plenty of applications, one data. Highest requirements, highest quality. Affordability is an aspect that might be understood in different ways. At its base, everything goes around the performance. Enterprise Data Warehousing platform has to be efficient enough to support all the tasks independently on their complexity or type. All in all, affordability means also the price proper to offered quality, what's extremely important with recent, stronger and stronger limited budgets. It's not a big thing to create simple solution able to support singular tasks. In a case of enterprises, the real goal is to prepare a platform ready to grow in proportion to organization's growth. Enterprise Data Warehousing platforms have to be equally efficient in supporting separate processes and the whole company's performance. A platform has also to be prepared for embracing larger data volumes and - therefore - more complex tasks. That's called scalability. Most of recent companies offer different kinds of services. Only sparse of them are set on a concrete type of activity. Responsible management demands being prepared for all business scenarios depending on market tendencies. Not infrequently companies have to resign from their main area due to the losses it causes, and - instead of that - find another, so far omitted niche. That demands another feature of Enterprise Data Warehousing platforms - flexibility. Changing business scenario, modifying strategies, remodeling the organization cannot require implementing new platform. That would result in absurdly high waste of time and costs. Instead of that, enterprises choose, sometimes more expensive, but flexible solution. Finally, there's also another one feature but not as obvious as the previous ones. Normalized design of Enterprise Data Warehousing favors information transparency, but most organizations prefer de-normalized databases as long as they suit them better. The best for platform would be to operate with both types of design but that's often impossible.